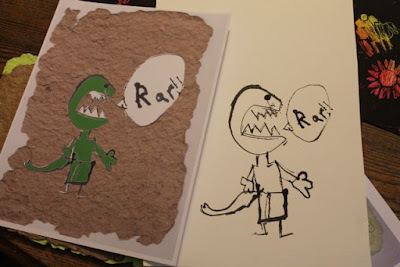 Many of the activity ideas I use to celebrate birthdays with my family come during presentations given by the author or illustrator. 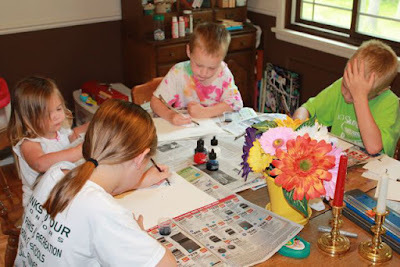 I frantically take notes in my journal about their path to becoming published, the process used to create their picture books, and any other interesting tidbits that might be shared, all with the hopes that something will spark an idea. If it happens, I circle it to make sure I see it when it comes time to celebrate the birthday. 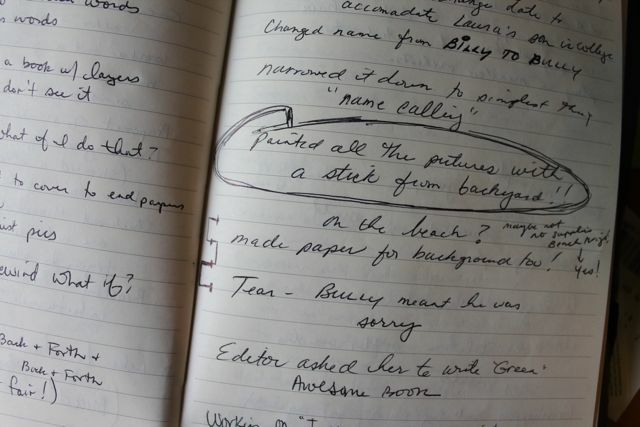 The photo below shows the notes I took in my journal the day I heard Laura Vaccaro Seeger speak at the Mazza Museum in Findlay, Ohio. Fast forward almost 11 months from the day I heard Seeger speak; I was researching for this birthday celebration when I found the quote from Laura Vaccaro Seeger in an interview with Teaching Books, "I've been making picture books since I was five. I have always had tons of ideas for books, and it is fun to look back on my journals and see 'Picture Book Idea' on top of an entry. 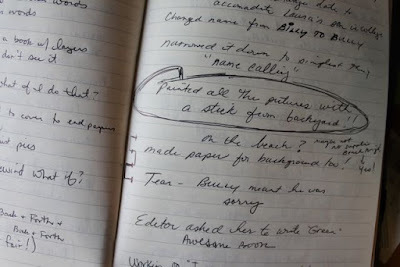 I used to even draw a big, black box around it so that if I ever needed to find the idea, I could." I had the idea, and I couldn't wait to see how the activity would unfold with my children. You will have to read on to find out all about it. But, first a little about Laura Vaccaro Seeger. 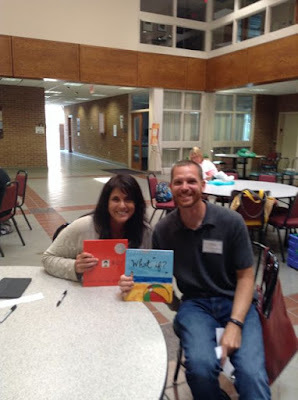 Laura Vaccaro Seeger is the author and illustrator of over fifteen picture books including The Hidden Alphabet, What if?, and the Dog and Bear series. The Horn Book declared, in 2008, that Laura is the "New Queen of the Concept Book" and said, "[she is] never one to shy away from a difficult setup." Her books often include lift-the-flaps and unique die-cuts. "I feel that each of my books is conceptual. Even the Dog and Bear books, which are about friendship, feel conceptual to me." (Publishers Weekly). Her love of making picture books as a child led to her attending The School of Art and Design at SUNY (New York), after a brief time studying to be an elementary teacher. After college, she spent ten years as an animator for NBC and created animated openings for numerous television shows including The Today Show and Saturday Night Live. Then, her son was born which prompted her to become a freelance animator to allow her to fulfill her duties as a mom and still work, but it became too much. The eighty-hour work week got her thinking about other ways to be creative. She decided to stop working as an animator to try to finish some of her picture book ideas. She was introduced to people at DK publishing, met with them, and presented 14 "one-of-a-kind books." (Publishers Weekly). She was offered her first publishing contract for I Had a Rooster (2001) which included a CD with songs by Pete Seeger (her husband's uncle). 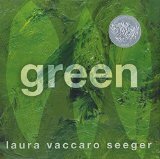 Laura went on to be awarded two Caldecott Honor awards with First the Egg (2008) and Green (2013). She also won two Theodor Seuss Geisel Honor awards for First the Egg (2008) and One Boy (2009). Her upcoming book is I Used To Be Afraid which is scheduled to be released in September 2015. 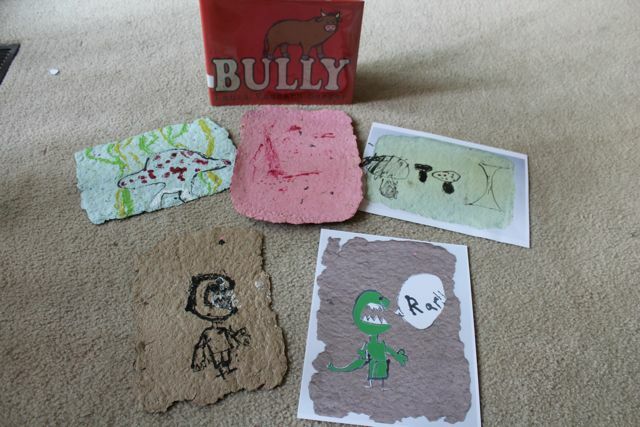 The book that would be the inspiration for our birthday celebration for Laura Vaccaro Seeger was Bully. At the beginning this post, I mentioned that Laura talked about the book at the Mazza Museum Summer Conference. She told the audience that Bully was actually inspired by her brother Billy. 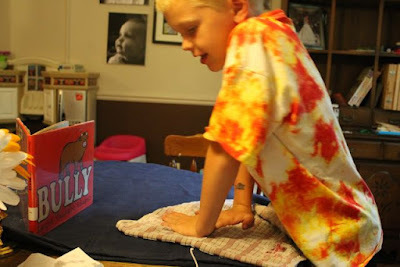 Her siblings were planning a birthday party for her mom and Billy was being big bully. He wanted everything about the party to be his way. So, Laura changed his name from Billy to Bully! Bully is a picture book of only 22 words (I think I counted right?!?). 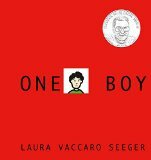 Amazingly, Laura Vaccaro Seeger effectively addresses the topic of bullying with so few words. Her illustration however, get readers saying a whole lot more. Bully is a bull who just experienced another bull being mean to him. He proceeds to take it out on smaller animals who just want to play with him. Each time Bully is mean to an animal he grows bigger and bigger until a goat brings him back down to size. Bully realizes he was wrong and the other animals give a second chance. Laura Vaccaro Seeger said in a YouTube video that she struggled with the illustrations until she tried something completely out-of-box or should I say out-of-the-backyard, "I wanted a spontaneous art style. Something with a little edge to it. I was having trouble achieving this with my paints and brushes and pens. 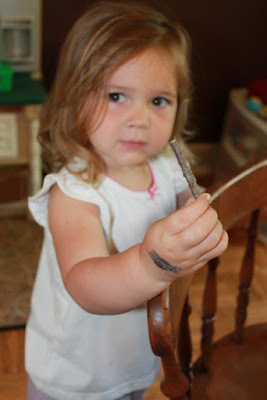 I discovered that a twig when dipped in india ink gave me that sort of rough edginess that I was looking for." The illustrations she created with the twig and ink would be placed on top of handmade papers. She explained, "It quickly became clear to me that it was important that the emphasis remain on the characters, their feelings, and the power of their words. So I needed a subtle, unobtrusive background that was at once inconspicuous and organic. 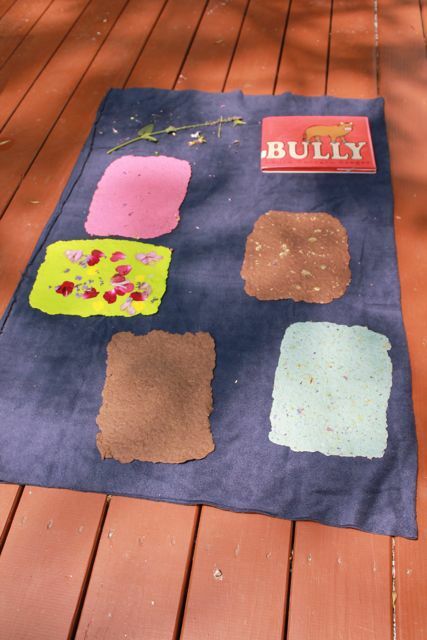 I combined three different hand-made papers to create twenty different backgrounds. In this way, the background of every spread is unique, so there is a subtle sense of movement." (DeepRootsMag). 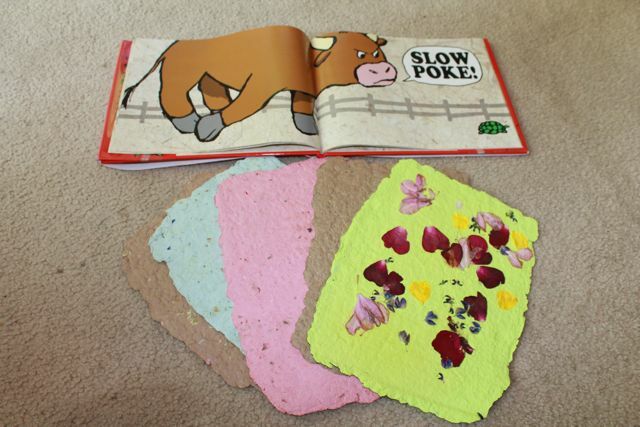 I wanted my children to make both the handmade paper backgrounds and the twig and ink illustrations. 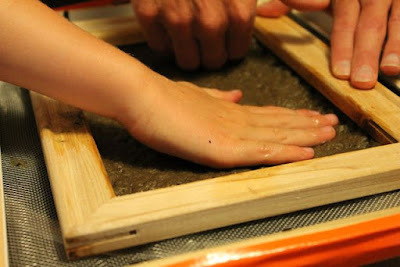 Knowing that it was take time for the handmade paper to dry we started with that part of the project. 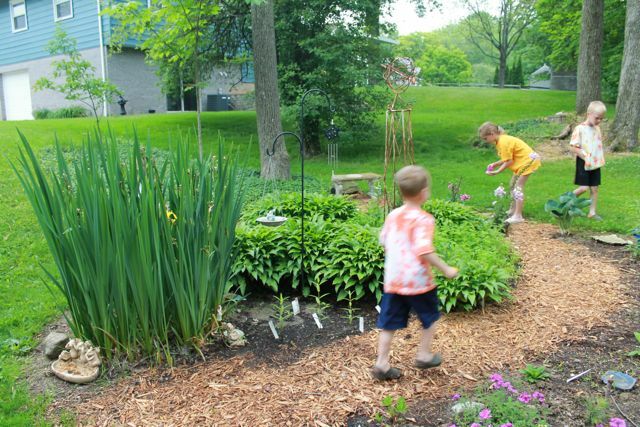 I wanted incorporate organic materials from our backyard for the papers. My children went right for the flowers! 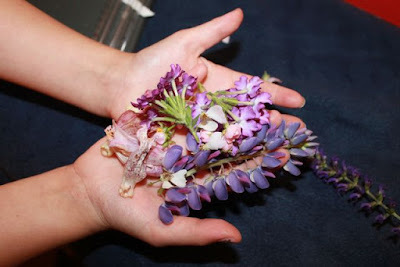 My oldest daughter focused on purple flowers for her paper. My oldest son was the first to make his paper. 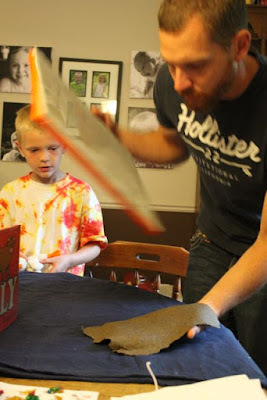 He used brown packaging paper that we had sitting in the basement. 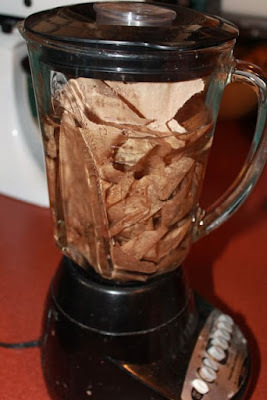 He tore it into small pieces and placed them in the blender. 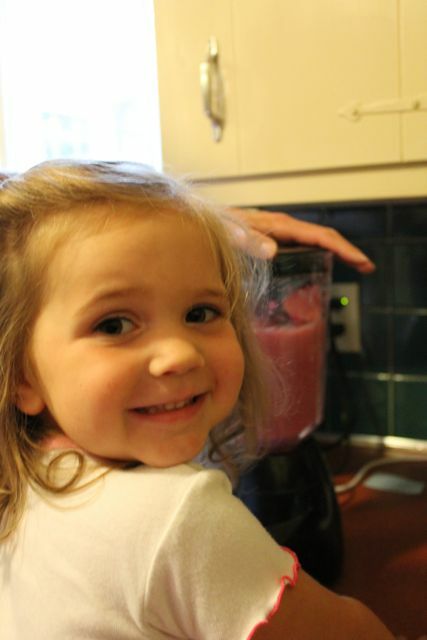 Next, we filled the blender with water and let it for a minute or two. 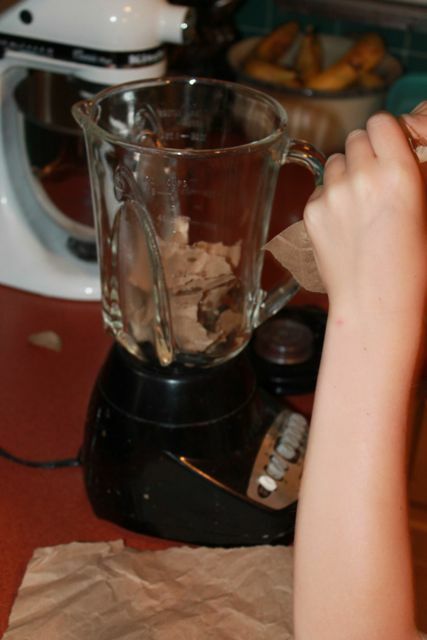 This is a picture of my oldest daughter's paper pulp in the blender. She used about 9 sheets of light-blue paper. 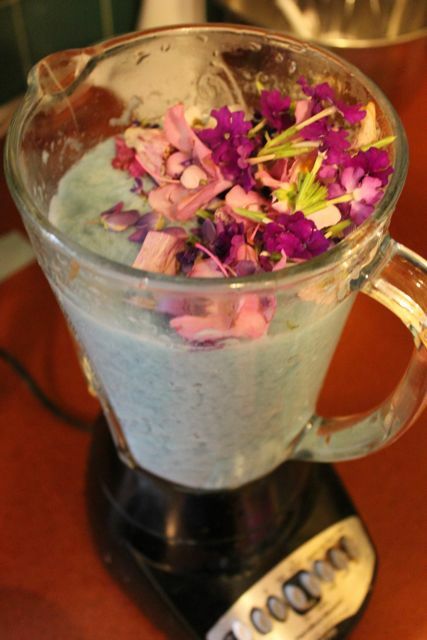 It was well-blended and then she added her flowers. She pulsed the flowers into the mixture until her flowers were chopped the way she wanted. My son thought his paper pulp looked gross! 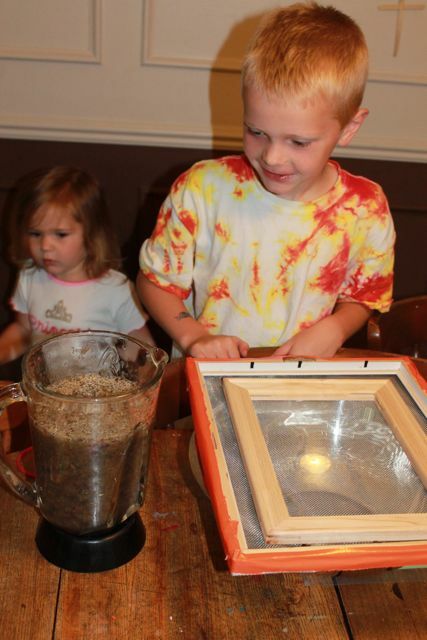 Notice the two frames we had over a large bowl. 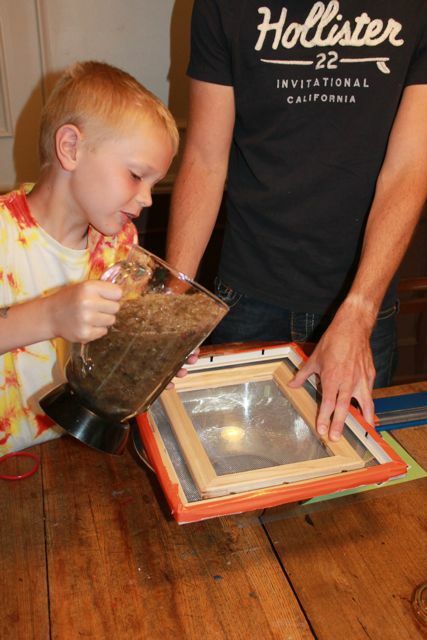 The larger frame had wire mesh stapled to it. The smaller frame did not have wire mesh. He poured the paper pulp into the center frame. Then he used a spatula to spread out the pulp evenly within the frame. We found it easier to use our hands. 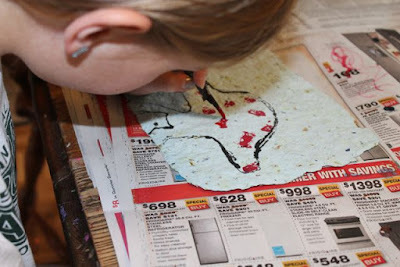 Once we pushed out all the water we could I carefully flipped the paper onto a thick piece of fabric. He pushed more water out of the paper with a towel. 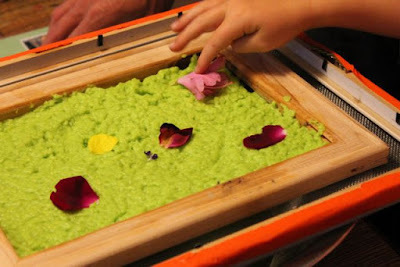 My youngest son chose not to blend his flowers, but to press them into his pulp before we squeezed any of the water out. My youngest daughter was excited to blend her pink paper pulp. 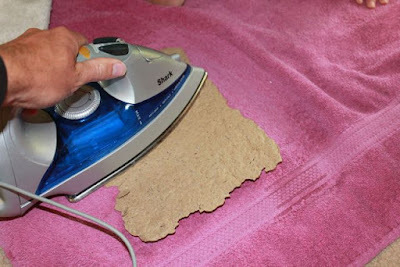 The paper dried in the sun on the deck all afternoon and then I brought the paper inside to dry overnight. In the morning, the paper was was dry, but had curled a little. We spritzed the paper with water and ironed it flat. 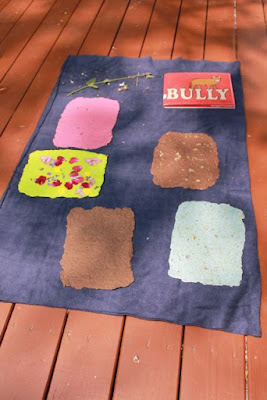 Handmade papers for backgrounds just like BULLY. 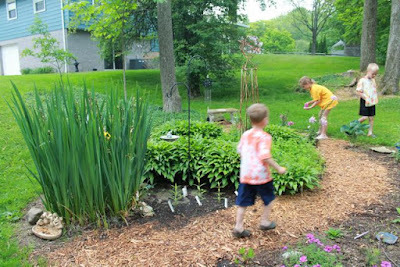 Next, they found the perfect twigs in the backyard. 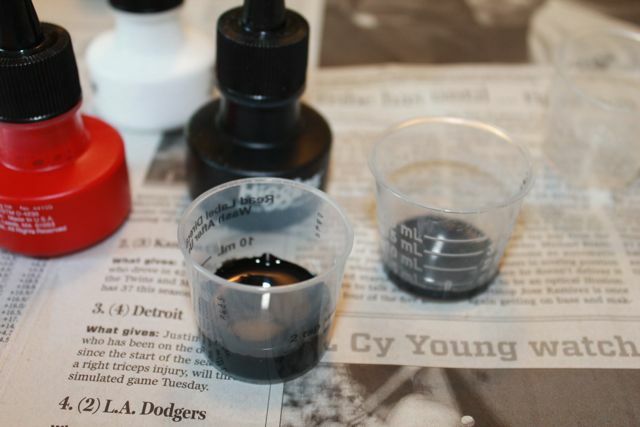 We divided our black india drawing ink into medicine cups (which I almost recycled the day before, but my kids stopped me; "We might need those for a project, Dad!"). 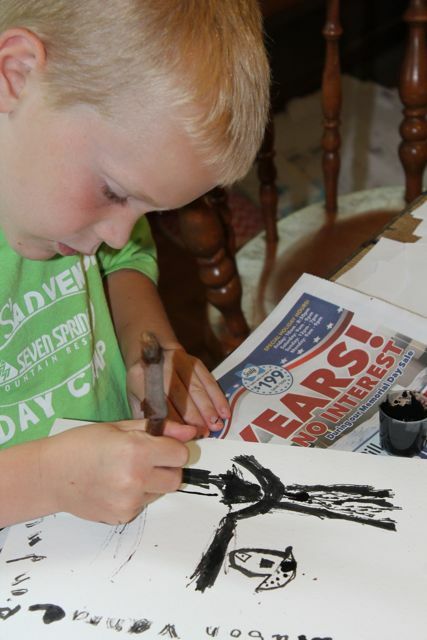 First, they practiced drawing with the ink and twigs on white watercolor paper. He created some "edgy" drawings just like Laura Vaccaro Seeger! One was of a dinosaur. He recently figured out he was good at drawing dinosaurs. 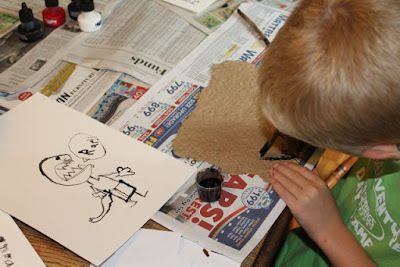 I told my children that they did not have to draw with the twigs and ink on their handmade paper, but three out of the four insisted. My daughter used red drawing ink to draw a mushroom. My youngest was pleased with her artwork. 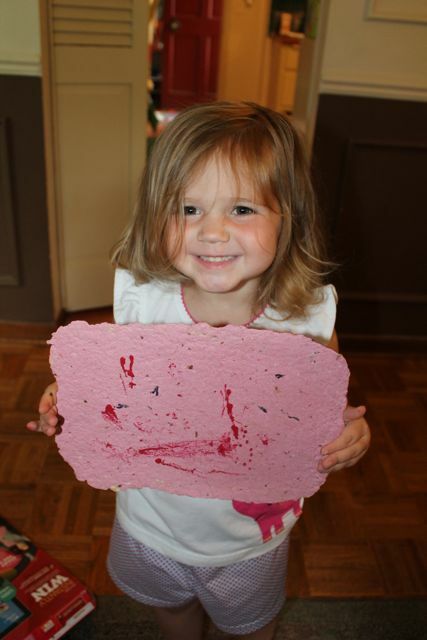 I was worried that one of my children would make a mistake drawing on their handmade paper. I scanned all the papers into the computer before they began -- just in case! Since, I had the digital images of the paper, I decided to create digital artwork with my son's dinosaur drawing. 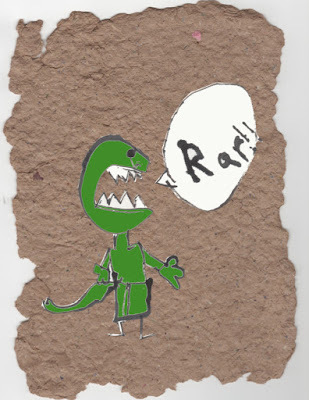 I scanned his dinosaur, added green, and placed it on the scanned image of his paper. It tuned out really cool! From an idea in a journal to reality! 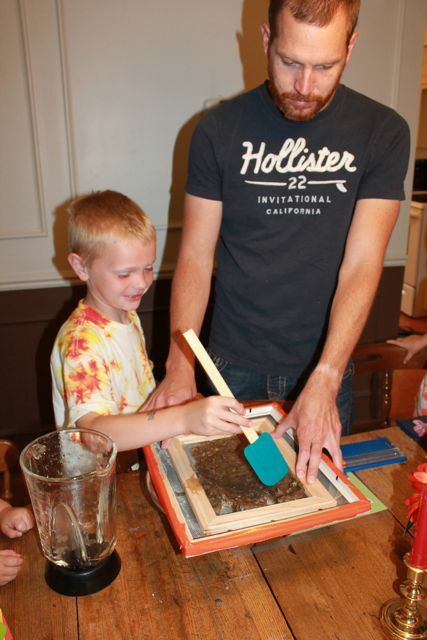 It was so much fun to spend time with my children creating these works of art! Laura, it was a pleasure meeting you at the Mazza Museum. Thank you for sharing your birthday with us. We hope you have an awesome birthday! We really loved reading your books this week! !